Mmmmmmm eggnog. One of my favorite holiday flavors. How about you? Are you an eggnog lover? I know it tends to be an all or nothing kind of thing. Either you love it, or despise it. I love it spiked, not spiked, in my coffee, and now in this amazingly moist and delicious, easy to make, Eggnog Pound Cake. I know we have barely gotten over our post Thanksgiving turkey comas, but I am sooooo excited for Christmas this year I couldn't even wait for the 1st of December to start decorating! I swear I am just a big ol' overgrown kid when it comes to Christmas, but this year it is even more so because the G-baby is old enough to really enjoy it. Last year we propped her up to open presents, and she was more interested in the wrapping paper than the actual presents. This year is going to be a blast. Going to see Santa, although I think there might be a chance of freak out with this since she is a bit shy with new people. Going to see Christmas lights has always been a family tradition, so it will be fun to do it with her. Baking Christmas cookies, hopefully Kylee with help stir instead of just eating the cookie dough! I think she is a bit to young for another one of our traditions, watching National Lampoon's Christmas Vacation. We usually watch it ohhhhh a minimum of 3 to 4 times. But, this cake, shall we just take a moment to discuss it? But when it is as good as this? 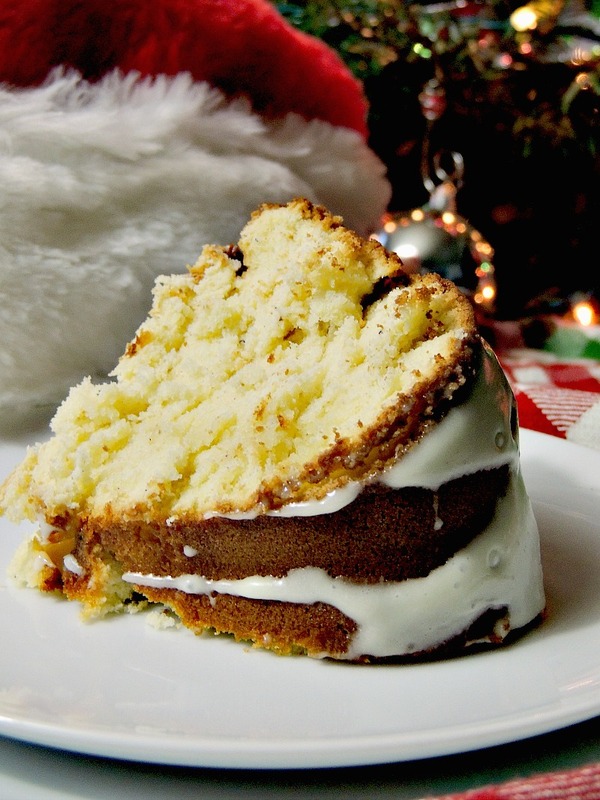 Moist, with that perfect pound cake texture, and deeeeelicious eggnog flavor? I dare you not to want to keep it all to yourself! This easy to make pound cake is super moist and tender, and full of that delicious eggnog flavor. Sift together flour, baking powder, salt and nutmeg, set aside. In the bowl of a stand mixer, cream butter until smooth, slowly add in sugar until all combined. Beat butter on medium speed until light and cream and color pales. Add in eggs, one at a time, beating well after each addition. Add the vanilla. Alternating the flour mixture and eggnog, starting and ending with the flour, add in both. Mix until smooth. Spoon batter into greased and floured bundt pan. Bake in a preheated 350 degree oven for 50-55 minutes, until toothpick inserted in center, comes out clean. Let cake rest in pan for 20 minutes before turning out onto rack to cool completely. For the glaze, whisk together 1 to 2 tablespoons of eggnog and powdered sugar in a small mixing bowl, adding eggnog until desired consistency. Spoon over cooled cake. 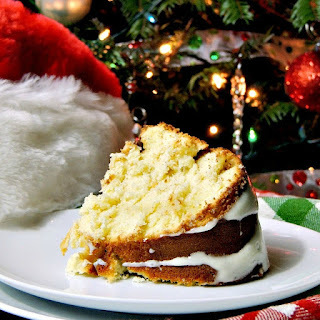 My husband's favorite flavor of the Christmas season is Eggnog and he would love to have a piece of this cake. I think I will be making this for our Christmas eve dessert. Thanks. Oh yay!! I hope everyone loves it as much as we do!! This would be so perfect for our family Christmas party!!! I have been trying to figure out what desserts I should bake! While I am not a fan of the eggnog drink, I do love eggnog related desserts. This looks delish! Oh I think you would like this Meghan! 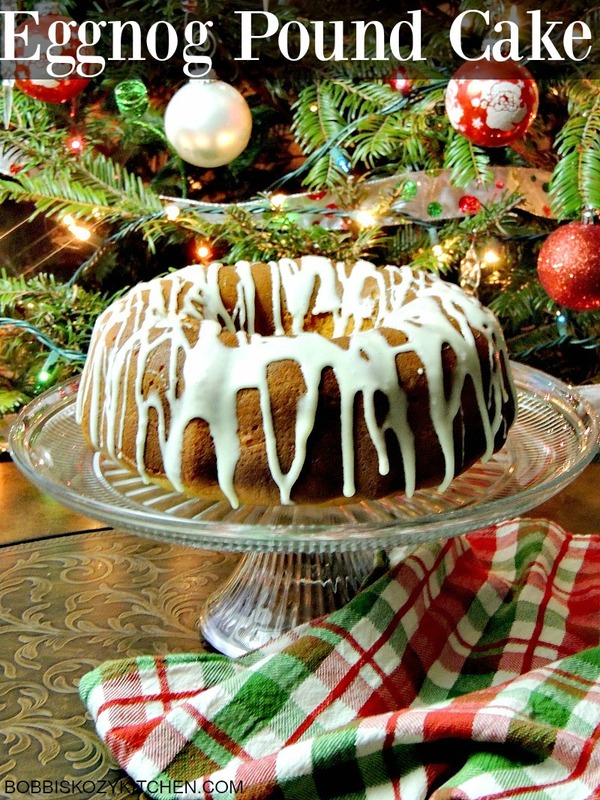 This is a wonderful holiday recipe, my family would love if I made this! Thank you for sharing such a fun cake recipe! This would be the only reason why I would purchase eggnog! Thank you for the delicious recipe idea! Hehe I hope you go buy some! Sweet! Glad you like it Angie!! I'm with you on loving anything eggnog flavored! This cake looks incredibly delicious and I can't wait to try it out. After a "test run," I have a feeling I will be making another one for Christmas Eve dessert! I have never frozen it before so I can not say for sure. I would assume that it is like any other pound cake and can be frozen for maybe a month or two? I would leave the glaze off until you are ready to serve though. 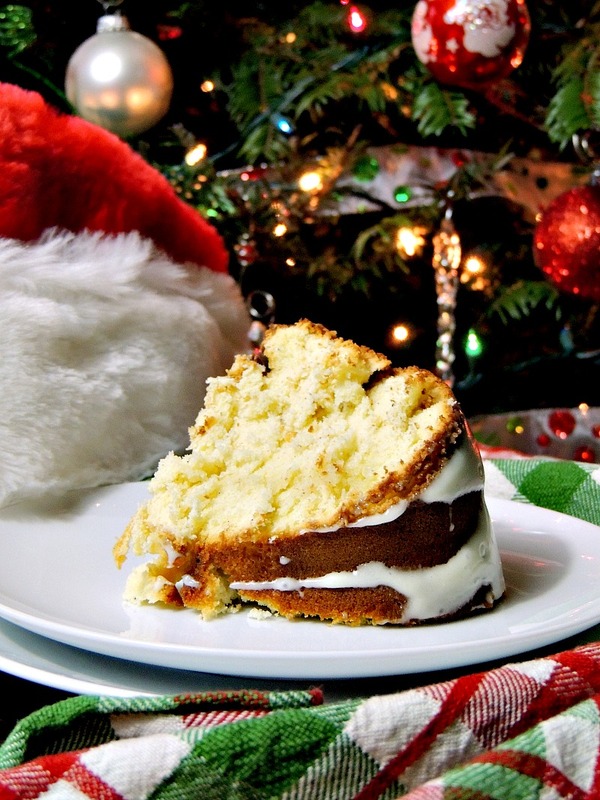 I had a lot of pound cake in my life, but I've never heard of eggnog pound cake. I can't wait to make this for my family this holiday season! I would never drink egg nog but I have no issue putting it in pound cake. It must make it delicious. My husband would love this. I would seriously pig out on this. Yum! Pound cake has always made me happy. I can take egg nog in doses when I drink it because it's so thick, so this is the perfect way to have it! I have an eggnog lover at my house! He would love this! I am going to have to give it a try! It looks really yummy! This sounds amazing! I love eggnog, and I've been trying to use it in different recipes this year, this one is a keeper! Eggnog is one of my favourite Christmas traditions. 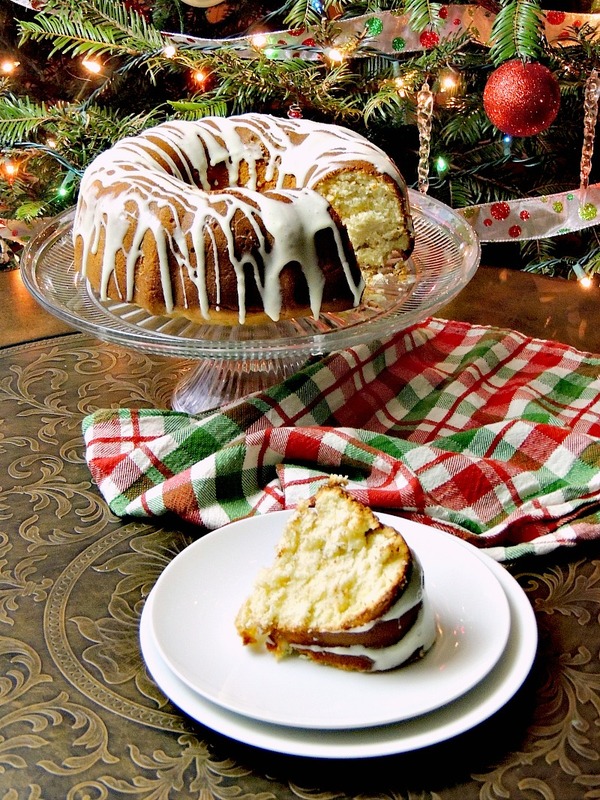 An eggnog pound cake sounds divine and one to add to the must make list. Oh my goodness! THIS cake looks PILLOWY SOFT!!! I just want to nestle in it! And then eat it as I curl up lol! I'm a pound cake lover, too. What a great idea for a new flavor. My favorite is lemon, but yours definitely looks worth trying. 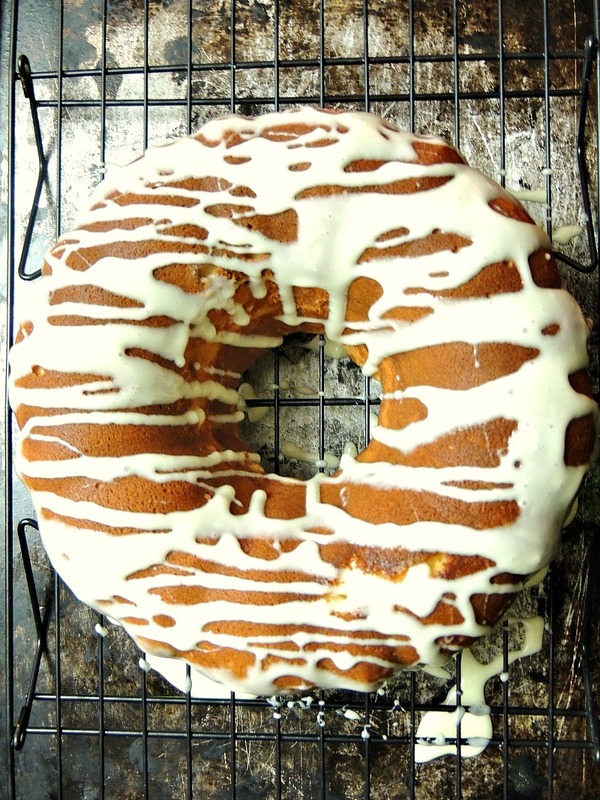 This Eggnog Pound Cake looks so delicious! I would like to try baking it myself. I am obsessed with eggnog, so this would be perfect for me to try! I love eggnog everything. This looks seriously so amazing! 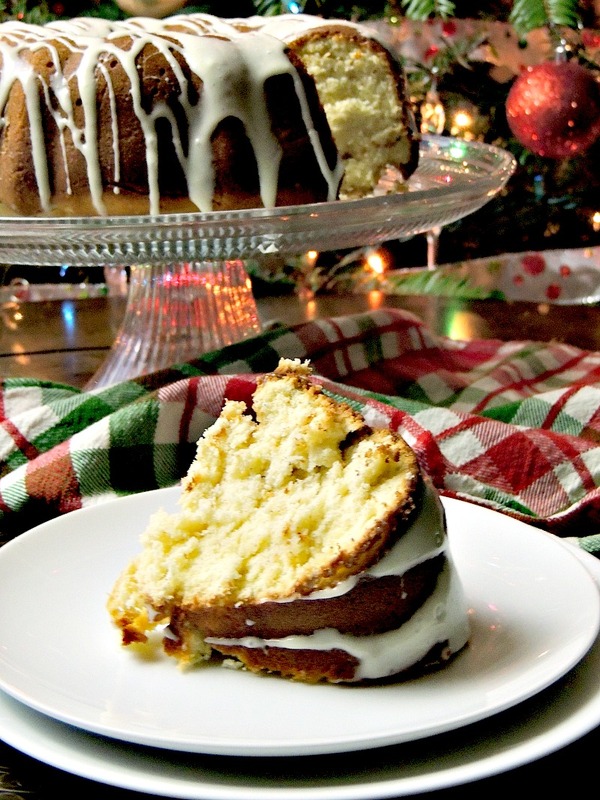 Oh this eggnog pound cake looks delicious am craving! Perfect for this holiday and with a freshly brewed coffee. I don't think I've ever had pound cake. It came out so nice! I was never a fan of eggnog, even when I still consumed dairy and eggs. Another recipe to try on over the Holidays. Now I am imagining of designing it with red and green to add the Holiday Christmas colors. Excited to try it. Few days to go! I'm personally not a big fan of eggnog but I do love me some pound cake. I'm going to add this to my todo list for the weekend. I have never had eggnog so I really don't know if I like it. The cake looks delicious! What a yummy holiday treat! This looks so fabulous for Christmas celebrations! Made this for Christmas in my William Sonoma Standing Snowman Pan. Was a hit!